A quickie, but a fantastic one nonetheless. 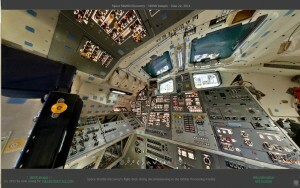 During its decomissioning, the Space Shuttle Discovery had one of those cool 360 degree virtual photos done, which means one can browse around the cockpit* and look at everything. As if you were there, but minus the uncomfortable spacesuit. Discovery was the third shuttle to join NASA’s fleet – it did so in 1983 – and had such awesome achievements as being the shuttle which lifted the Hubble Space Telescope into space. After spending some 352 days in space over the course of its career, Discovery’s final flight – STS-131 – took science racks to the International Space Station. It was retired in March 2011, a few months before the shutdown of NASA’s space shuttle programme. Click on the image above to go have fun. * read: fantasise happily about pressing ALL the buttons.